(TibetanReview.net, Nov20, 2016) – Despite strong objections from China, Mongolia welcomed Tibet’s exiled spiritual leader, the Dalai Lama, when he landed on the Chinggis Khaan International Airport in capital Ulaabatar in the afternoon of Nov 18. The six-day visit to Mongolia takes place after his successful tour of Japan without any word of protest from China. The abbot of the host monastery Gaden Tehkchen Ling, Mongolia’s largest, led the welcome for the Dalai Lama, joined by a representative of the Indian Embassy and government representatives. Apparently to allay China’s concerns, the abbot had earlier stressed that the visit will focus purely on spiritual matters. Mongolia’s president, prime minister, and speaker of parliament have said they supported the monastery’s invitation to the Dalai Lama while explaining that no meetings with government officials had been planned, reported rfa.org Nov 18. And Mongolia’s Minister of Foreign Affairs Tsendiin Munkh-Orgil said Nov 18 that the Dalai Lama’s visit had no connection with the government, reported indialivetoday.com Nov 19. On Nov 19, hundreds of monks and worshippers waited hours on Nov 19 in biting, minus 20 C (minus 4 F) temperatures at the monastery for a glimpse of the 81-year-old Tibetan spiritual leader, who is widely revered in the country, with many families keeping his picture in small household shrines, the report added. Many Mongolians had undertaken arduous journeys, often as representatives of communities in far flung remote areas to see the Dalai Lama. AFP quoted a monk named Dolgoriin Lkhagva as saying he had travelled 600 kilometres (370 miles) on icy roads so he could convey the Dalai Lama’s message to worshippers back home. Telo Rinpoche, the Dalai Lama’s Moscow-based representative, has said the Tibetan spiritual leader will give religious teachings and public talks and take part in discussions on Buddhism and Science, reported voatibetanenglish.com Nov 19. At Gaden Tehkchen Ling, the Dalai Lama will speak to abbots and senior religious teachers from across the country. 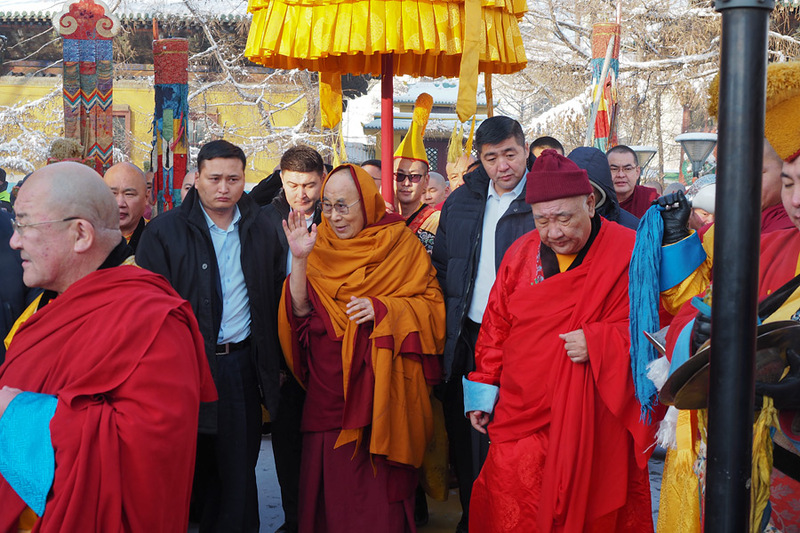 He will also visit the monastery of the Kalkha Jetsun Dampa, the ninth spiritual head of Mongolia’s Buddhist community. The AP reported cited religious scholars as saying that during the visit the Dalai Lama was expected to offer input on the search for the 10th reincarnation of the Kalkha Jetsun Dampa. Geng has called the Dalai Lama a political refugee who has long been engaged in activities to split China and alienate Tibet from China in the name of religion. The Dalai Lama has previously visited Mongolia in 1979, 2002, 2006, and 2011.